Bridal jewellery adds the perfect finishing touch to your wedding gown. It can emphasise your own unique style, adding a touch of luxury whilst magically enhancing your skin tone. Do you already have a clear idea of your dream jewellery? If so, let me turn that into reality for you! Or would you prefer to sit together and create something amazing and unique? As well as the design and colour of your wedding gown, we'll need to consider your skin tone, the neckline, whether your hair will be up or down, whether your taste is classic or modern... It's a wonderfully enjoyable and creative process and you can have confidence that the result will be timeless, elegant, memorable and individual. An heirloom in the making! We can even create a matching set for the entire bridal party consisting of necklaces, ear studs, tiaras, cufflinks, tie-pins... The possibilities are endless! I would be pleased to make your wedding bands too. enchanting, unblemished perfection. No wonder pearls have long been the jewel of choice for brides. The ancient Greeks believed that wearing pearls would promote marital bliss. Besides their natural beauty, pearls are surprisingly affordable, coming in an extraordinary array of shapes, sizes and natural colours. They combine beautifully with Swarovski crystals of all colours, and gemstones such as sapphires, rubies, and emeralds. Freshwater pearls are considered to offer the power of love, protection and luck, and to bring great wisdom. But above all, pearls make you look and feel amazing. They enhance your skin tone, and bring a luminous glow. Many brides offer a gift of pearls to their bridesmaids, perhaps a bracelet, a single strand necklace, simple perfect ear studs, drop earrings or flamboyant hair ornaments. 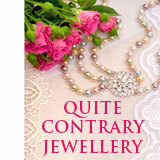 Have a look at the ready to wear bridal jewellery which may give you some ideas.